It’s been a few years since I’ve eaten at Frank & Helen’s, but I drive by the restaurant almost every day on my way home. When I decided last night that I was in the mood for pizza and I was going to pick it up rather than pay a delivery charge plus a driver tip, I realized it was a perfect time to try out Frank & Helen’s again. 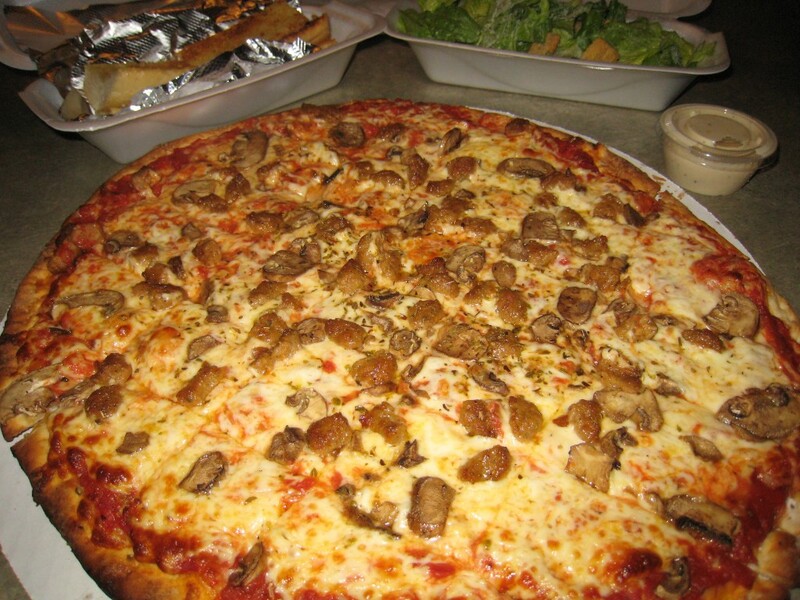 Frank & Helen’s serves St. Louis style thin crust pizza. The default version is made with mozzarella cheese, but all you have to do is ask and you can get a pizza with freshly ground provel cheese. In addition to my pizza, I ordered a Caesar salad and garlic bread. I’ve also had great burgers at Frank & Helen’s. Though they are famous for their broasted chicken, I’m not sure I’ve ever tried it. I also noticed that the current menu offers pesto as one of the pizza sauce options. Now I know I’ll have to go back soon! When you step into the restaurant, you are stepping back into time. I’m pretty sure that the decor has not been updated since the restaurant was opened in 1956. This is a family restaurant serving home style food by friendly faces in a dimly lit dining room. 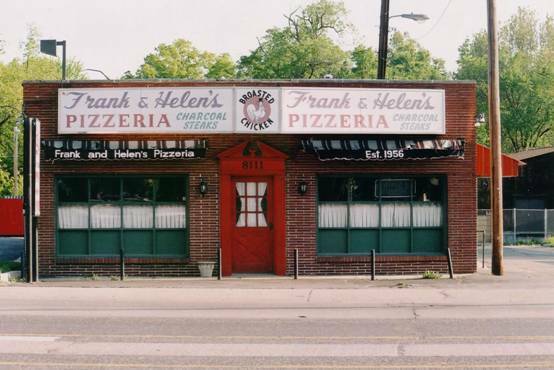 Since 1956, Frank & Helen’s has been a family tradition in University City. Over the years, our pizza, pasta and chicken have remained the favorites of our loyal customers. Children who grew up with us now introduce us to their own families, and they are happy to find that the food is just as they remembered (if not a little better). The devotion of our customers fills us with pride as we fill your plates. Frank Seitz, his wife Betty, and his sister Helen began a tradition that has been passed along to me and my wife Rebecca. As a former police officer, detective, and the manager of Frank & Helen’s for over six years, I have served this community since 1995. In keeping with the family tradition, my wife and I purchased the restaurant in 2008 from our friends, and previous owners Scott & Mary DePolito. With our care and guidance, my wife and I pledge to keep Frank & Helen’s a place to find good food and good friends in a relaxed family atmosphere. The restaurant is pretty small and my guess is that even the non-smoking sections wouldn’t meet my “no nearby smoke smell” requirements. However, they do offer a smoke-free night on Sundays for people like me. I can’t wait until the entire county goes non-smoking next January. And as a bonus for families, they offer a Kids Eat Free special on Tuesday – Thursday after 5 pm (with an adult entree purchase of equal or greater value). UPDATE: Frank & Helen’s is now smoke-free with the enactment of the St. Louis County smoking ban. I’ve also tried the pesto sauce now and it’s really good! So if you thought that eating out in UCity was all about exploring the Loop, you need to venture over to Olive Blvd and try out Frank & Helen’s.